Prior to this heatwave, it had bloomed very nicely. I hope it manages a re-bloom in the fall, it may. I deadheaded it to encourage that, even though it tends towards big, red hips. Nicely fragrant as well. Whether it behaves as a true climber or not remains to be seen, but it is certainly a nice addition to the pergola. Now if I could only figure out why one of the clematis (the biggest, most vigorous one) suddenly went belly up…. 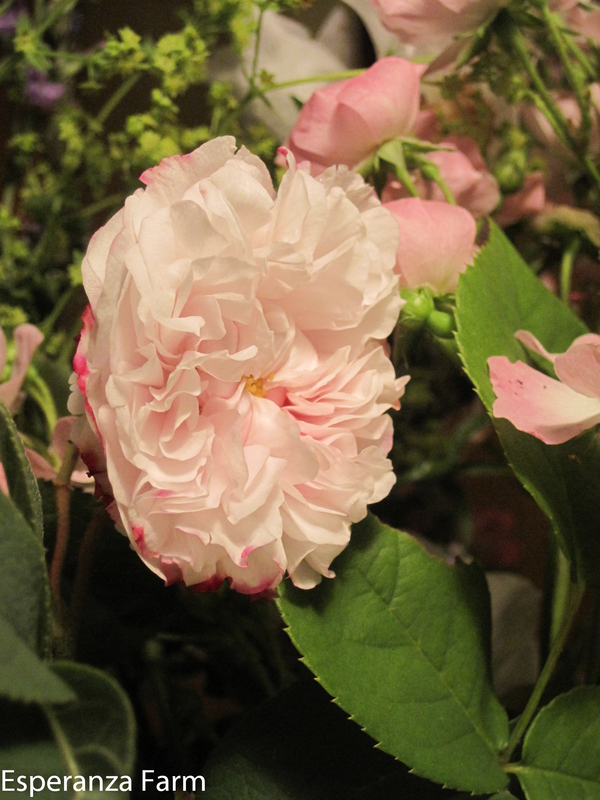 David Austin’s ‘A Shropshire Lad’ in its first year! It seems to be standing up to this rain rather well too. Furthermore, it was slid into its spot right next to the short/shrub clematis that is also blooming on that pillar. I am rather pleased with that planting job, since the clematis was already there, and both plants needed to be close to the pillar’s south side. 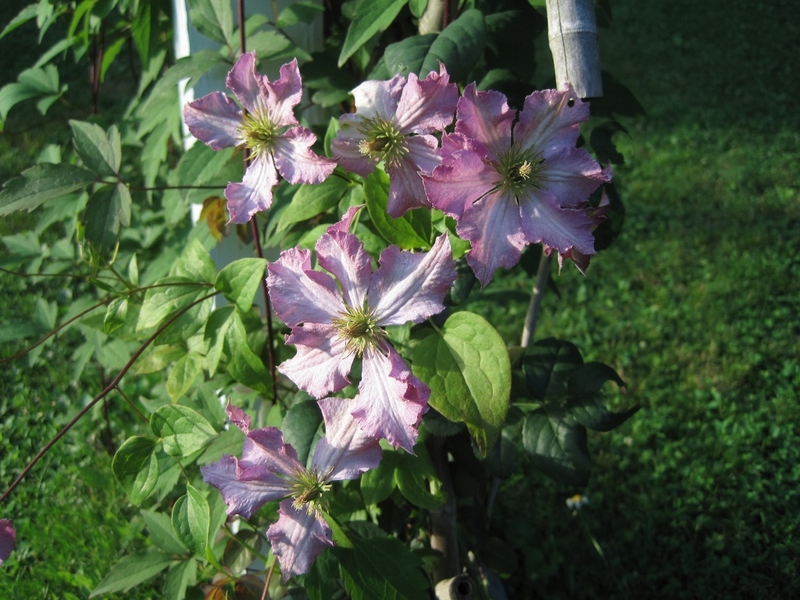 I honestly don’t know the identity of the clematis…. 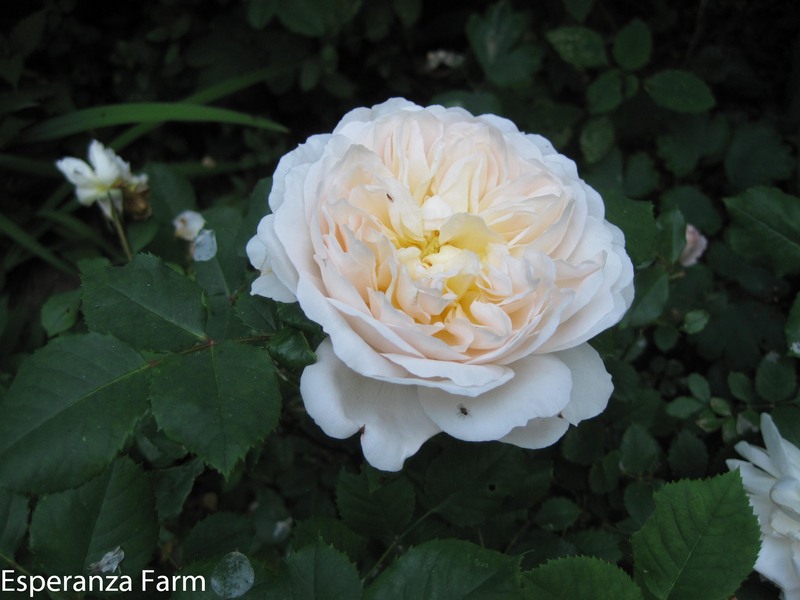 I am waiting to see if the named white rose ‘alba maxima’ planted this year is the same, if so I will be quite happy. In any case, what I believe to be ‘alba maxima’ blooming. This seems to be the survivor of all survivors, lurking in the underbrush until just enough sunlight was given to it when the hedgerow across the way was cut down about 8 years ago. It had to have been planted at the driveway’s entrance, a good two generations ago, and then shaded out, forgotten entirely. It is back now, and blooms faithfully. A tall lanky bush with lovely (if brief flowers) and beautiful rose hips. I should hate it. When it takes over a field or hedgerow it is a nightmare, an appalling example of an invasive plant taking over all in its path. Keeping it trimmed as a bush takes effort, the thorns rip through jeans and skin with ease. The ticks like it (though not nearly as much as barberry)….but so do the birds. BUT…on a warm, June morning with the sun shining, the world green gleaming with last night’s rain…. And all, all through the air is the heavy, sweet scent of roses. Wild roses. Multiflora roses in truth. The fragrance of a cultivated rose has nothing on the multiflora and rugosas. David Austin’s ‘Crocus Rose’, one of his tougher ones, a reliable bloomer that grows well with minimal care. And (like essentially all of his roses) looks elegant. It doesn’t care much for the heat and humidity of course, dropping its petals much faster, but that is simply a rose being a rose, it seems to me! I have to figure out how to take rose cuttings. This is one of our oldest roses, buried for years at the head of the drive; it must have been planted after the highway was shifted, so after 1935, but probably not too much later. 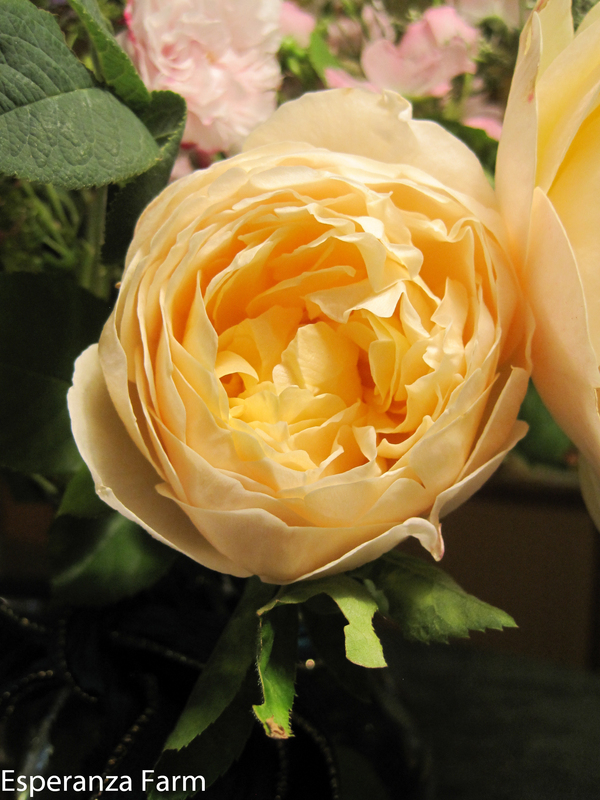 It is tolerant of shade, incredibly winter hardy, more so than the other old roses which died nearly to the ground*. 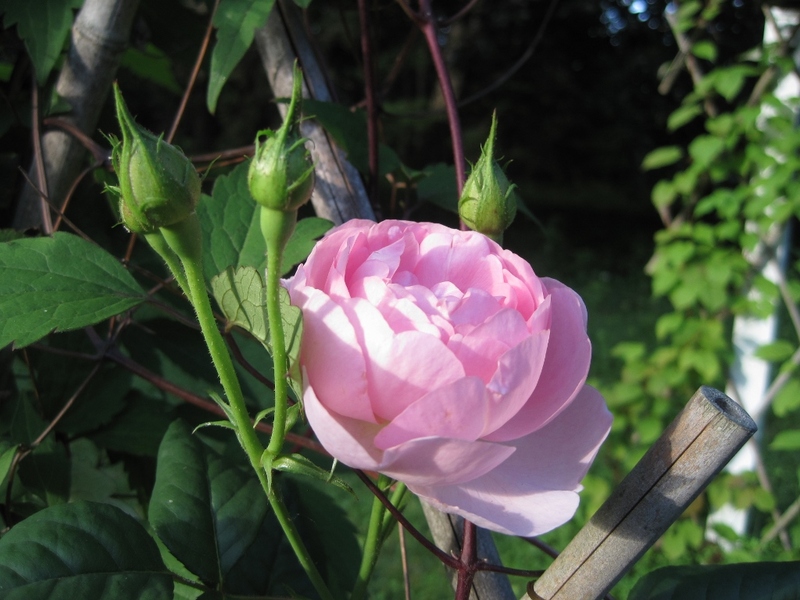 It is also free of pests (though that might be because there are no other roses near it), mildly fragrant, about five feet tall, and once blooming. 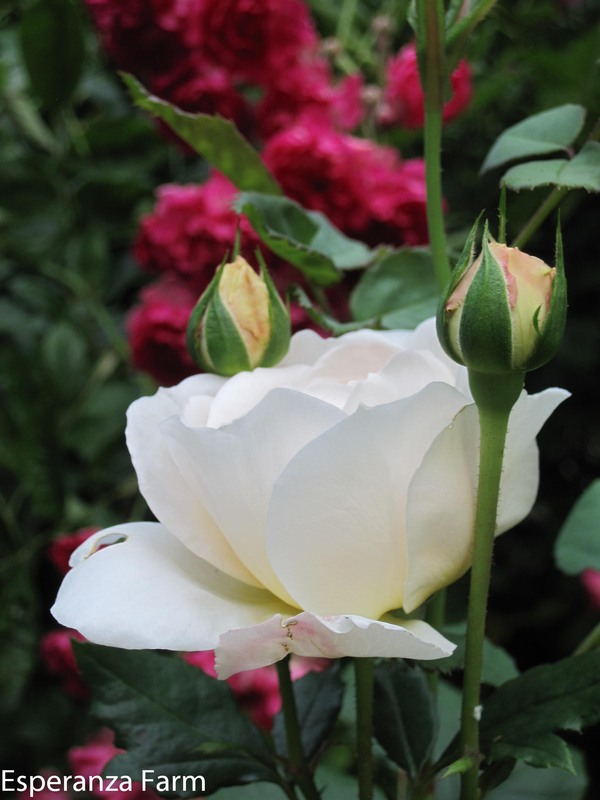 In my opinion, it is pretty much what a white rose ought to look like. 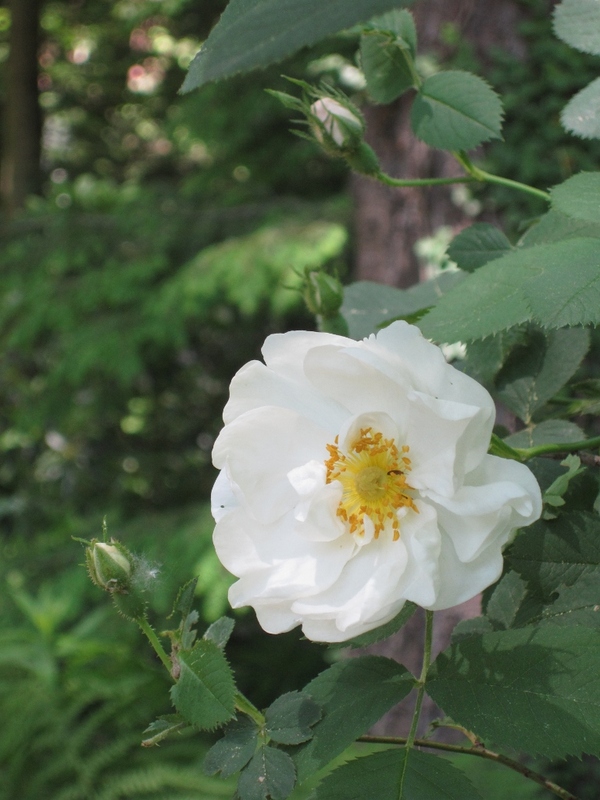 It has no suggestion of rugosa heritage, the best I can tell it is the true alba semi-plena: the white rose of York. *Sadly, this means that they won’t flower this year since unlike the modern roses, they apparently bloom on last year’s growth. One of the old Moss roses in the garden. This is the only nearly white one; most of them are light pink with deeper pink edging. 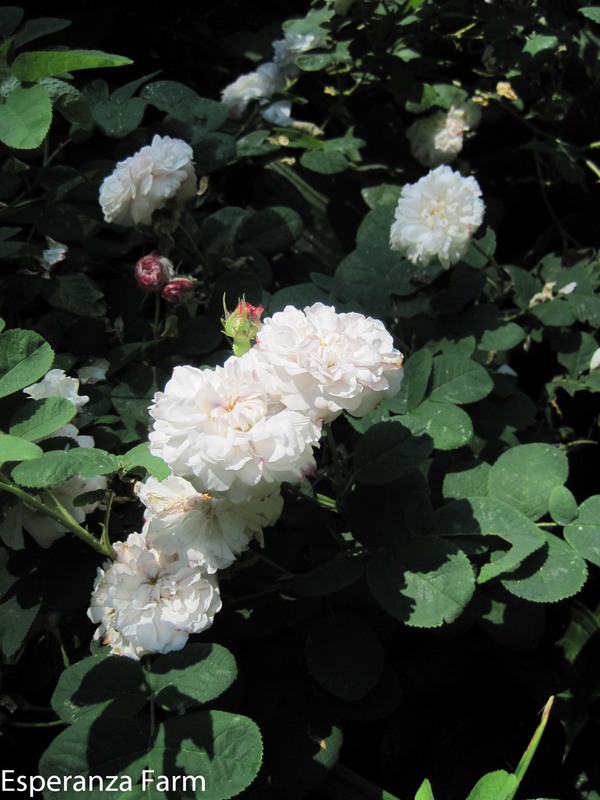 It is not uncommon for the medium pink ones to have flowers that range in shade from white through blush pink to a classic rose pink, all on the same bush. The buds are always edged with dark pink. There are one or two bushes as well that are a solid deep pink. They do not repeat bloom and have only a little fragrance. 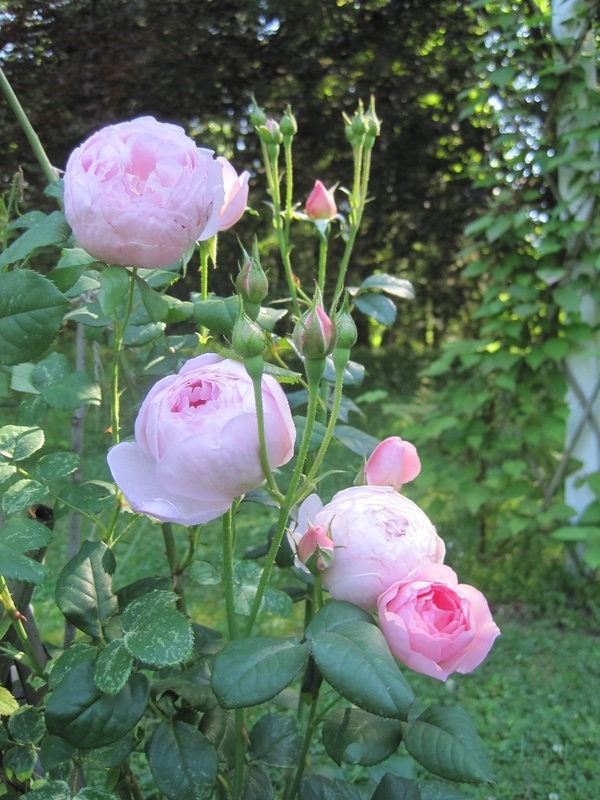 These roses date from an unknown era; they resurfaced when the Norway Maples were cut down about fifteen years ago. It is remotely possible that they date from the 1960’s; but it is much more likely that they date from the turn of the century. They are tough, but not overly vigorous, sometimes having only one or two canes. Although apparently disease free, they tend to be attacked by Japanese beetles and aphids. 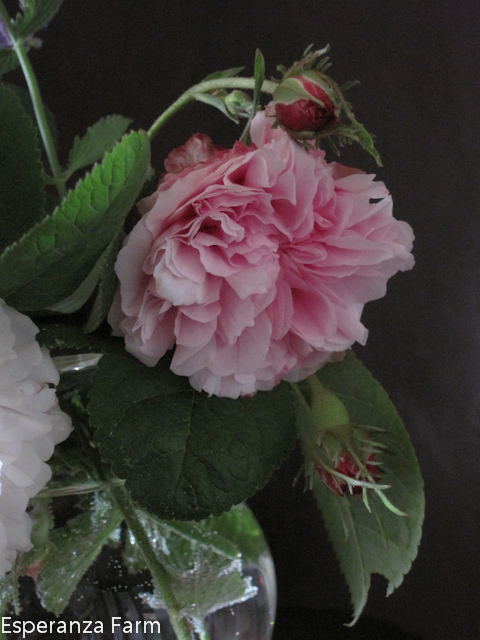 It might be ‘Morden’s Blush’ or ‘Winchester Cathedral’ or possibly another that I can’t recall at the moment, beyond it is the old ‘Fourth of July’ rose, a floribunda type that sprawls and blooms with abandon, usually on the fourth of July, and is as tough as nails, name unknown.